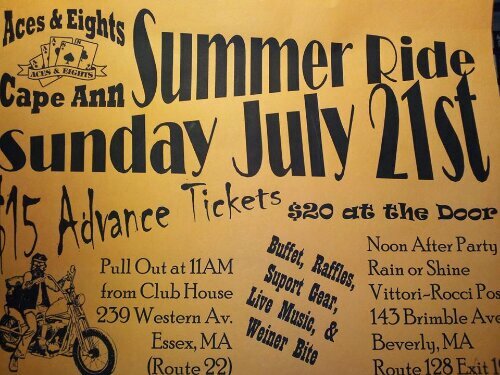 Aces & Eights Cape Ann are hosting a Summer Ride on Sunday, July 21st, and pulling out from the A&E Clubhouse at 239 Western Avenue in Essex, MA. The ride will be followed by an after-party at Noon, rain or shine, at the Vittori-Rocci Post at 143 Brimbal Avenue in Beverly, MA. Advanced Tickets are $15/each, and you can get them from any A&E member. Visit their Facebook page for more details and tickets.